K.L. is a vibrant, modern, tropical city punctuated by both delicate, ancient minarets and some of the world's tallest skyscrapers. Here you'll find glossy malls and luxury hotels on food-stall lined streets. A number of wonderful living markets which morph into trendy nightspots and also a wealth of religious buildings for the city's numerous significant religious communities. The best places to stay in Kuala Lumpur are like the rest of this city's great architecture, a mix of colonial treasures and modern steel and glass. Kuala Lumpur sprawls outwards from the centre into the suburbs which seem to go on for ages. Just a few generations ago this was a tin mining town founded by Chinese and Malay prospectors. It was the British who made it the colonial capital in the 18th Century. So even the old temples are actually relatively new. Kuala Lumpur's speedy growth says a lot about this place and its people. Even though the famous Petronas Towers are no longer the world's highest buildings, as they were when they opened in 1998, the cityscape is still littered with cranes. Apart from that you'll be treated to plenty of wondrous architecture, more lush gardens than most visitors are expecting, an incredibly busy and vibrant Chinatown, a number of excellent museums and some SERIOUS opportunities to shop. 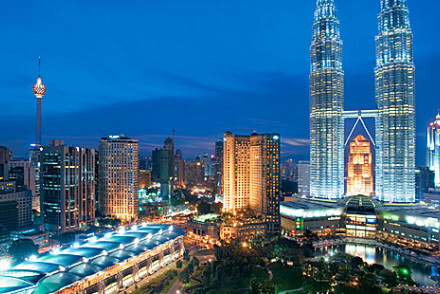 Kuala Lumpur has 66 shopping malls, and an even larger number of markets. There are plenty of spas and golf courses too if you need to wind down after all the visual excitements of K.L. You should definitely check out the Petronas Twin Towers, the largest set of twin towers in the world! Wander along the sky bridge and head to the observation deck to enjoy breathtaking views of the area. KLCC Park is a welcome area of greenery located in the heart of the city. If you've come with the family then there's a play area and a swimming pool for kids, plus at night there are dancing water fountains which are always a spectacle. The Islamic Arts Museum Malaysia boasts a wide variety of artefacts (dating back as far as the 12th century) and explains the wide role of art in Islamic life, particularly temple art. If you fancy seeing actual temples then head to Thean Hou Temple or Sri Maha Mariamman Temple, Malaysia's oldest functioning Hindu temple. To avoid disappointment, be sure to book ahead if you want to guarantee yourself a room in one of the best places to stay in Kuala Lumpur. 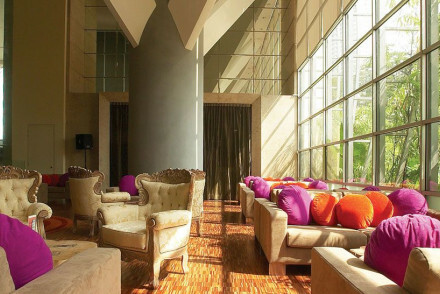 The Mandarin Oriental Kuala Lumpur is a huge hotel with the range of restaurants, bars and facilities to match. Guests also benefit from spectacular views from the poolside bar and exemplary service. 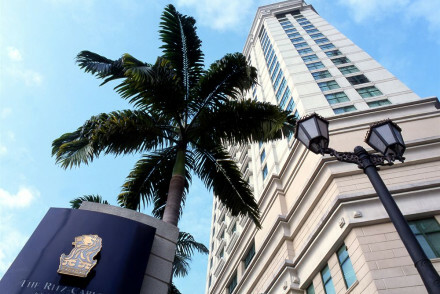 The Ritz Carlton, Kuala Lumpur is another big name luxury hotel right in the heart of Kuala Lumpur. 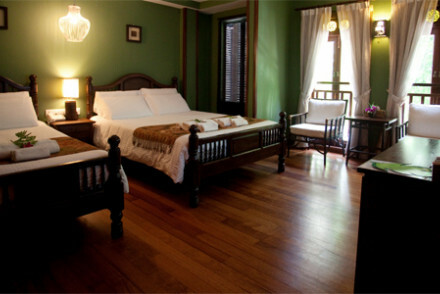 Rooms are sumptuous and there are several excellent restaurants, an extensive spa and private butler service. 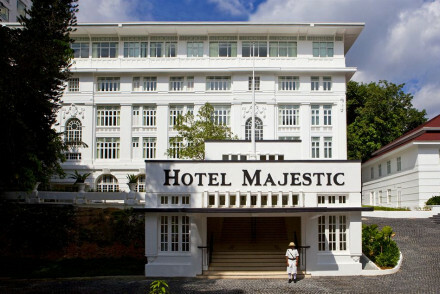 The Majestic Hotel Kuala Lumpur is an iconic 1930s era colonial mansion, converted into a 300-room hotel with an Art Deco spa, an orchid conservatory, an enormous pool, six bars and a fantastic restaurant. Plus, the more basic rooms start from just £74 per night. For five stars worth of great value try the Hotel Maya, which is super contemporary with facilities galore. As well as a fantastic spa and incredible views from the rooftop bar, you can also upgrade and hire your own butler or private chef. The Villa Samadhi is a small resort laid out around a lagoon pool - it looks like it should be by the beach rather than in the heart of K.L... The 21 rooms are smart, with all the mod. cons., but they also start from just £91 per night. The Carcosa Seri Negara is a traditional white mansion turned hotel in green and leafy Lake Gardens. The decor is grand and elegant - think colonnades and sweeping marble staircases, whilst there's also an excellent Malayan restaurant. The Anggun is an 18-room, well priced, boutique hotel with sophisticated rooms, suites and family suites - some with private balconies overlooking the courtyard. There's a good Malay restaurant and you're close to Chinatown as well as the Petronas Towers. Despite the rainfall, the average temperature hovers around 28°C throughout the year so you'll never be chilly! International visitors can fly into Kuala Lumpur International Airport, located about 50km southwest of the city. From here, either take the train or the bus to the city centre. Malaysia Airlines and British Airways fly direct from Heathrow to Kuala Lumpur, with the journey taking around 13 hours. Browse though our list of all the places to stay in Kuala Lumpur. Consider heading for the coast and check out the best places to stay in Penang. An iconic 1930s colonial mansion with ultra glamourous interiors. Art deco spa, fantastic restaurant in an Orchid Conservatory, enormous pool, and sumptuous chic suites that have all the mod cons. A winning spot for tradition, style, and luxury rolled into one. Landmark - An iconic hotel from the 1930s. Foodies - Six bars and restaurants. A really great boutique hotel with excellent prices. Smart and sophisticated rooms, suites and family suites, all with mod cons, some with four poster beds and private balconies overlooking the courtyard. Good Malay restaurant and very family friendly. Value chic - The double rooms are excellent value. Local markets - Chinatown teahouse or buy silk goods from Little India. Views - Visit the Petronas Towers for jaw dropping views. Sights nearby - Batu Caves. A swanky Five Star modern boutique for the luxury traveller. Super contemporary suites have lots of space and enormous bath tubs. Fantastic spa, private chef or butler service, and dazzling views from the roof top Sky bar. Excellent facilities and lots of style. Sights nearby - Petronas Twin Towers. A calming oasis in a bustling capital. Lagoon-style swimming pool and pavilion restaurant serving fusion Malaysian cuisine. Smart luxurious rooms and suites have shiny wooden floors and all the mod cons. Ideal for anyone with an eye for style and a desire for calm. Swimming Pool - Fantastic lagoon-style pool surrouned by tropical cabanas for lounging in. Local markets - Chinatown and the Central Market. Luxury on a grand scale in the centre of the city. Contemporary classic interiors throughout opulent rooms and suites. Fantastic facilities; Japanese, Cantonese, or Continental restaurants, extensive spa, business facilities, and excellent views from the poolside. Service second to none. Foodies - Five restaurants serve Cantonese, Japanese and Continental cuisine. Views - Fanastic views over the city from the poolside bar. Luxury on a grand scale in the city's entertainment district. Sumptuous rooms and suites in creams with all the mod cons and private hot tubs. Fantastic Cantonese and Continental restaurants, extensive spa and private butler service. For those who like to be indulged on every level. Lively - The hotel sits in the entertainment district of Malaysia's chief commercial and transportation hub. A glorious hotel set in Lake Gardens. 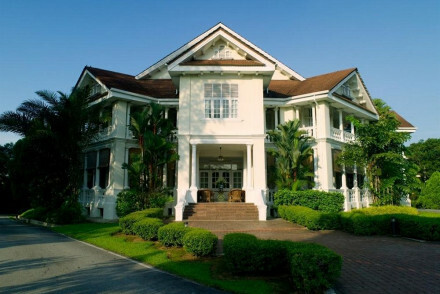 A traditional white mansion with verandahs, stucco balconies, and a leafy garden. Grand elegant interiors have marble floors, colonnades, and sweeping staircases. Excellent modern Malay cuisine. A sophisticated spot for couples. Local markets - Central Market, hosted in an Art-Deco building. Sights nearby - Malaysian Houses of Parliament, Batu Caves. Outstanding location - Situated in Lake Gardens.